"Nuclear program of North Korea" redirects here. For its nuclear power program, see Nuclear power in North Korea. North Korea has a military nuclear weapons program and also has a significant quantity of chemical and biological weapons. As of 2003, North Korea is no longer a party to the Treaty on the Non-Proliferation of Nuclear Weapons (NPT). The country has come under sanctions after conducting a number of nuclear tests, beginning in 2006. The nuclear program can be traced back to about 1962, when North Korea committed itself to what it called "all-fortressization", which was the beginning of the hyper-militarized North Korea of today. In 1963, North Korea asked the Soviet Union for help in developing nuclear weapons, but was refused. The Soviet Union agreed to help North Korea develop a peaceful nuclear energy program, including the training of nuclear scientists. Later, China, after its nuclear tests, similarly rejected North Korean requests for help with developing nuclear weapons. Soviet engineers took part in the construction of the Yongbyon Nuclear Scientific Research Center and began construction of an IRT-2000 research reactor in 1963, which became operational in 1965 and was upgraded to 8 MW in 1974. In 1979, North Korea began to build a second research reactor in Yongbyon, as well as an ore processing plant and a fuel rod fabrication plant. North Korea's nuclear weapons program dates back to the 1980s. Focusing on practical uses of nuclear energy and the completion of a nuclear weapon development system, North Korea began to operate facilities for uranium fabrication and conversion, and conducted high-explosive detonation tests. In 1985 North Korea ratified the NPT but did not include the required safeguards agreement with the IAEA until 1992. In early 1993, while verifying North Korea's initial declaration, the IAEA concluded that there was strong evidence this declaration was incomplete. When North Korea refused the requested special inspection, the IAEA reported its noncompliance to the UN Security Council. In 1993, North Korea announced its withdrawal from the NPT, but suspended that withdrawal before it took effect. Under the 1994 Agreed Framework, the U.S. government agreed to facilitate the supply of two light water reactors to North Korea in exchange for North Korean disarmament. Such reactors are considered "more proliferation-resistant than North Korea's graphite-moderated reactors", but not "proliferation proof". Implementation of the Agreed Framework foundered, and in 2002 the Agreed Framework fell apart, with each side blaming the other for its failure. By 2002, Pakistan had admitted that North Korea had gained access to Pakistan's nuclear technology in the late 1990s. Based on evidence from Pakistan, Libya, and multiple confessions from North Korea itself, the United States accused North Korea of noncompliance and halted oil shipments; North Korea later claimed its public confession of guilt had been deliberately misconstrued. By the end of 2002, the Agreed Framework was officially abandoned. In 2003, North Korea again announced its withdrawal from the Nuclear Proliferation Treaty. In 2005, it admitted to having nuclear weapons but vowed to close the nuclear program. On October 9, 2006, North Korea announced it had successfully conducted its first nuclear test. An underground nuclear explosion was detected, its yield was estimated as less than a kiloton, and some radioactive output was detected. On January 6, 2007, the North Korean government further confirmed that it had nuclear weapons. On March 17, 2007, North Korea told delegates at international nuclear talks that it was preparing to shut down its main nuclear facility. The agreement was reached following a series of six-party talks, involving North Korea, South Korea, China, Russia, Japan, and the United States begun in 2003. According to the agreement, a list of its nuclear programs would be submitted and the nuclear facility would be disabled in exchange for fuel aid and normalization talks with the United States and Japan. This was delayed from April due to a dispute with the United States over Banco Delta Asia, but on July 14, International Atomic Energy Agency inspectors confirmed the shutdown of North Korea's Yongbyon nuclear reactor and consequently North Korea began to receive aid. This agreement fell apart in 2009, following a North Korean satellite launch. In April 2009, reports surfaced that North Korea has become a "fully fledged nuclear power", an opinion shared by International Atomic Energy Agency (IAEA) Director General Mohamed ElBaradei. On May 25, 2009, North Korea conducted a second nuclear test, resulting in an explosion estimated to be between 2 and 7 kilotons. The 2009 test, like the 2006 test, is believed to have occurred at Mantapsan, Kilju County, in the north-eastern part of North Korea. This was found by an earthquake occurring at the test site. In February 2012, North Korea announced that it would suspend uranium enrichment at the Yongbyon Nuclear Scientific Research Center and not conduct any further tests of nuclear weapons while productive negotiations involving the United States continue. This agreement included a moratorium on long-range missile tests. Additionally, North Korea agreed to allow IAEA inspectors to monitor operations at Yongbyon. The United States reaffirmed that it had no hostile intent toward the DPRK and was prepared to improve bilateral relationships, and agreed to ship humanitarian food aid to North Korea. The United States called the move "important, if limited", but said it would proceed cautiously and that talks would resume only after North Korea made steps toward fulfilling its promise. However, after North Korea conducted a long-range missile test in April 2012, the United States decided not to proceed with the food aid. On February 11, 2013, the U.S. Geological Survey detected a magnitude 5.1 seismic disturbance, reported to be a third underground nuclear test. North Korea has officially reported it as a successful nuclear test with a lighter warhead that delivers more force than before, but has not revealed the exact yield. Multiple South Korean sources estimate the yield at 6–9 kilotons, while the German Federal Institute for Geosciences and Natural Resources estimates the yield at 40 kilotons. However, the German estimate has since been revised to a yield equivalent of 14 kt when they published their estimations in January 2016. On January 6, 2016 in Korea, the United States Geological Survey detected a magnitude 5.1 seismic disturbance, reported to be a fourth underground nuclear test. North Korea claimed that this test involved a hydrogen bomb. This claim has not been verified. As described below, a "hydrogen bomb" could mean one of several degrees of weapon, ranging from enhanced fission devices to true thermonuclear weapons. Within hours, many nations and organizations had condemned the test. Expert U.S. analysts do not believe that a hydrogen bomb was detonated. Seismic data collected so far suggests a 6–9 kiloton yield and that magnitude is not consistent with the power that would be generated by a hydrogen bomb explosion. "What we're speculating is they tried to do a boosted nuclear device, which is an atomic bomb that has a little bit of hydrogen, an isotope in it called tritium," said Joseph Cirincione, president of the global security firm Ploughshares Fund. The German source which estimates for all the North Korea's past nuclear test has instead made an initial estimation of 14 kt, which is about the same (revised) yield as its previous nuclear test in 2013. However, the yield estimation for January 2016 nuclear test was revised to 10 kt in the subsequent nuclear test from North Korea. On February 7, 2016, roughly a month after the alleged hydrogen bomb test, North Korea claimed to have put a satellite into orbit around the Earth. Japanese Prime Minister Shinzō Abe had warned the North to not launch the rocket, and if it did and the rocket violated Japanese territory, it would be shot down. Nevertheless, North Korea launched the rocket anyway, claiming the satellite was purely intended for peaceful, scientific purposes. Several nations, including the United States, Japan, and South Korea, have criticized the launch, and despite North Korean claims that the rocket was for peaceful purposes, it has been heavily criticized as an attempt to perform an ICBM test under the guise of a peaceful satellite launch. China also criticized the launch, however urged "the relevant parties" to "refrain from taking actions that may further escalate tensions on the Korean peninsula". A fifth nuclear test occurred on September 9, 2016. This test yield is considered the highest among all five tests thus far, surpassing its previous record in 2013. The South Korean government said that the yield was about 10 kt despite other sources suggesting a 20 to 30 kt yield. The same German source which has made estimation of all North Korea's previous nuclear tests suggested an estimation of a 25 kiloton yield. Other nations and the United Nations have responded to North Korea's ongoing missile and nuclear development with a variety of sanctions; on March 2, 2016, the UN Security Council voted to impose additional sanctions against North Korea. In 2017, North Korea test-launched two ICBMs, the second of which had sufficient range to reach the continental United States. In September 2017, the country announced a further "perfect" hydrogen bomb test. The Korean Central News Agency claims that the "U.S. has long posed nuclear threats to the DPRK" and "the U.S. was seized by a foolish ambition to bring down the DPRK", so it "needed a countermeasure". North Korea has been suspected of maintaining a clandestine nuclear weapons development program since the early 1980s, when it constructed a plutonium-producing Magnox nuclear reactor at Yongbyon. Various diplomatic means have been used by the international community to attempt to limit North Korea's nuclear program to peaceful power generation and to encourage North Korea to participate in international treaties. In May 1992, the International Atomic Energy Agency's (IAEA) first inspection in North Korea uncovered discrepancies suggesting that the country had reprocessed more plutonium than declared. IAEA requested access to additional information and access to two nuclear waste sites at Yongbyon. North Korea rejected the IAEA request and announced on March 12, 1993, an intention to withdraw from the NPT. In 1994, North Korea pledged, under the Agreed Framework with the United States, to freeze its plutonium programs and dismantle all its nuclear weapons programs in return for the normalization of diplomatic relations and several kinds of assistance, including resources for alternative energy supplies. By 2002, the United States believed North Korea was pursuing both uranium enrichment technology and plutonium reprocessing technologies in defiance of the Agreed Framework. North Korea reportedly told American diplomats in private that they were in possession of nuclear weapons, citing American failures to uphold their own end of the Agreed Framework as a motivating force. North Korea later "clarified" that it did not possess weapons yet, but that it had "a right" to possess them, despite the Agreed Framework. In late 2002 and early 2003, North Korea began to take steps to eject International Atomic Energy Agency inspectors while re-routing spent fuel rods to be used for plutonium reprocessing for weapons purposes. As late as the end of 2003, North Korea claimed that it would freeze its nuclear program in exchange for additional American concessions, but a final agreement was not reached. North Korea withdrew from the Nuclear Non-Proliferation Treaty in 2003. On October 9, 2006, North Korea demonstrated its nuclear capabilities with its first underground nuclear test, detonating a plutonium based device with an estimated yield of 0.2–1 kilotons. The test was conducted at Punggye-ri Nuclear Test Site in North Hamgyong Province, and U.S. intelligence officials later announced that analysis of radioactive debris in air samples collected a few days after the test confirmed that the blast had taken place. The UN Security Council condemned the test and announced the imposition of Resolution 1874. On January 6, 2007, the North Korean government further confirmed that it had nuclear weapons. In February 2007, following the six-party talks disarmament process, Pyongyang agreed to shut down its main nuclear reactor. On October 8, 2008, IAEA inspectors were forbidden by the North Korean government to conduct further inspections of the site. On April 25, 2009, the North Korean government announced the country's nuclear facilities had been reactivated, and that spent fuel reprocessing for arms-grade plutonium has been restored. On May 25, 2009, North Korea conducted its second underground nuclear test. The U.S. Geological Survey calculated its origin in proximity of the site of the first nuclear test. The test was more powerful than the previous test, estimated at 2 to 7 kilotons. The same day, a successful short range missile test was also conducted. In May 2010, the North Korean government claimed to have successfully performed nuclear fusion. Although the claim was largely dismissed at the time, a 2012 analysis of radioisotopes suggested that North Korea may have performed two nuclear tests involving fusion. The paper was met with skepticism, as subsequent analysis of seismic data suggested no tests took place. In 2014, a study using seismic data found evidence for nuclear testing but a 2016 study once again dismissed claims of nuclear testing, suggesting that the seismic data was indicative of a minor earthquake. On February 12, monitors in Asia picked up unusual seismic activity at a North Korean facility at 11:57 (02:57 GMT), later determined to be an artificial quake with an initial magnitude 4.9 (later revised to 5.1). The Korean Central News Agency subsequently said that the country had detonated a miniaturized nuclear device with "greater explosive force" in an underground test. According to the Korea Institute of Geosciences and Mineral Resources, the estimated yield was 7.7–7.8 kilotons. Other researchers estimate the yield to have been 12.2 ± 3.8 kilotons. In December 2015, Kim Jong-un suggested that the country had the capacity to launch a hydrogen bomb, a device of considerably more power than conventional atomic bombs used in previous tests. The remark was met with skepticism from the White House and from South Korean officials. On January 6, after reports of a magnitude 5.1 earthquake originating in northeast North Korea at 10:00:01 UTC+08:30, the country's regime released statements that it had successfully tested a hydrogen bomb. Whether this was in fact a hydrogen bomb has yet to be proven. Experts have cast doubt on this claim. A South Korean spy expert suggested that it may have been an atomic bomb and not a hydrogen bomb. Experts in several countries, including South Korea have expressed doubts about the claimed technology because of the relatively small size of the explosion. Senior Defense Analyst Bruce W. Bennett of research organization RAND told the BBC that "... Kim Jong-un is either lying, saying they did a hydrogen test when they didn't, they just used a little bit more efficient fission weapon – or the hydrogen part of the test really didn't work very well or the fission part didn't work very well." Kim Jong-un, with what North Korea claims is a miniaturized silver spherical nuclear bomb, at a missile factory in early 2016. On March 9, 2016, North Korea released a video of Kim Jong Un visiting a missile factory. The international community was skeptical, IHS Jane's Karl Dewey said that "It is possible that the silver sphere is a simple atomic bomb. But it is not a hydrogen bomb." Furthermore, he said "a hydrogen bomb would not only be in two parts but also be a different shape". Nations across the world, as well as NATO and the UN, spoke out against the tests as destabilizing, as a danger to international security and as a breach of UN Security Council resolutions. China, one of North Korea's allies, also denounced the test. On September 9, 2016, a 5.3 seismic tremor was detected by seismograms in surrounding countries, after which North Korea confirmed it conducted another nuclear test. North Korea stated that this test has enabled them to confirm that its warhead can be mounted to a missile and to verify the warhead's power. It was previously doubted that North Korea could pair the nuclear warhead and missile together, but South Korean experts started to believe that North Korea can accomplish this goal within a few years[not in citation given] after the September 9 nuclear test. On February 18, 2017, China announced that it was suspending all imports of coal from North Korea as part of its effort to enact United Nations Security Council sanctions aimed at stopping the country’s nuclear weapons and ballistic-missile program. On March 6, 2017, North Korea launched four ballistic missiles from the Tongchang-ri region towards the Sea of Japan. The launch was condemned by the United Nations as well as South Korea. The move prompted US Secretary of State Rex Tillerson to embark on a diplomatic mission ten days later to Japan, South Korea and China, in an effort to address the heightened international tension in the region. On April 13, 2017, White House representative Nick Rivero was quoted saying the United States was "very close" to engaging in some sort of retaliation towards North Korea. President Trump commented on North Korea by saying they will fight the war on terrorism no matter the cost. On April 15, 2017, at the yearly major public holiday also known in the country as the Day of the Sun, North Korea staged a massive military parade to commemorate the 105th birth anniversary of Kim Il-sung, the country’s founder and grandfather of current leader, Kim Jong-un. The parade took place amid hot speculation in the United States, Japan, and South Korea that the country would also potentially test a sixth nuclear device, but failed to do so. The parade did publicly display, for the first time, two new intercontinental ballistic missile-sized canisters as well as submarine-launched ballistic missiles and a land-based version of the same. On April 16, 2017, hours after the military parade in Pyongyang, North Korea attempted to launch a ballistic missile from a site near the port of Sinpo, on the country's east coast. The missile exploded seconds after launch. Later that month, after a visit to Washington by the top Chinese leader, the US State Department announced that North Korea was likely to face economic sanctions from China if it conducted any further tests. On April 28, 2017, North Korea launched an unidentified ballistic missile over Pukchang airfield, in North Korean territory. It blew up shortly after take-off at an altitude of approximately 70 km (44 mi). On July 4, 2017, North Korea launched Hwasong-14 from Banghyon airfield, near Kusong, in a lofted trajectory it claims lasted 39 minutes for 930 km (578 mi), landing in the waters of the Japanese exclusive economic zone. US Pacific Command said the missile was aloft for 37 minutes, meaning that in a standard trajectory it could have reached all of Alaska, a distance of 6,690 km (4,160 mi). By targeting the deep waters in the Sea of Japan, North Korea was ensuring that American or Japanese divers would encounter difficulties when attempting to recover Hwasong-14's engine. Equally, North Korea was not attempting to recover any re-entry debris either, which South Korea pointed out is an indication that this first launch was of an ICBM which was far from ready for combat. As of July 2017, the U.S. estimated that North Korea would have a reliable nuclear-capable intercontinental ballistic missile (ICBM) by early 2018. On July 28, North Korea launched a second, apparently more advanced, ICBM, with altitude around 3,700 km (2,300 mi), that traveled 1,000 km (620 mi) down range; analysts estimated that it was capable of reaching the continental United States. 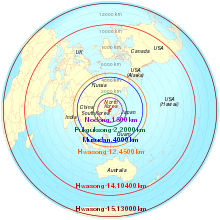 Aerospace engineer and weapons analyst Dr. John Schilling estimates the current accuracy of the North's Hwasong-14 as poor, at the mooted ranges which threaten US cities. Michael Elleman points out that July 28, 2017 missile re-entry vehicle broke up on re-entry; further testing would be required. On August 8, 2017 The Washington Post reported that the Defense Intelligence Agency, in a confidential assessment, stated that North Korea has sufficiently miniaturized a nuclear warhead to fit inside one of its long-range missiles. On August 12 The Diplomat reported that the Central Intelligence Agency, in a confidential assessment from early August, has concluded that the reentry vehicle in the July 28 test of Hwasong-14 did not survive atmospheric reentry due to apogee of 3,700 kilometers which caused structural stresses in excess of what an ICBM would have had in minimum energy trajectory. The CIA also concluded that North Korean reentry vehicle is likely advanced enough that it would likely survive reentry under normal minimum energy trajectory. On September 3, 2017, North Korea claimed to have successfully tested a thermonuclear bomb, also known as a hydrogen bomb. Corresponding seismic activity similar to an earthquake of magnitude 6.3 was reported by the USGS, making the blast around 10 times more powerful than previous detonations by the country. Later the bomb yield was estimated to be 250 kilotons, based on further study of the seismic data. The test was reported to be "a perfect success" by North Korean authorities. Jane's Information Group estimates the explosive payload of the North Korean thermonuclear/hydrogen Teller-Ulam type bomb to weigh between 255 and 360 kilograms (562 and 794 lb). On November 20, 2017, U.S. President Donald Trump announced that North Korea was re-listed by the State Department as a state sponsor of terrorism. Japan and South Korea welcomed the move as a method of increasing pressure on North Korea to negotiate about denuclearization. On November 28, 2017, North Korea fired an intercontinental ballistic missile in the first such launch from the country in more than two months. The missile, believed by the U.S. Military to be an ICBM, was launched from Sain Ni and flew roughly 1,000 km (620 mi) before landing in the Sea of Japan. After North Korea claimed that the missile was capable of "carrying [a] super-heavy [nuclear] warhead and hitting the whole mainland of the U.S.", Kim-Jong-Un announced that they had "finally realized the great historic cause of completing the state nuclear force", putting them in a position of strength to push the United States into talks. North Korea's plutonium-based nuclear reactors are located at the Yongbyon Nuclear Scientific Research Center, about 90 km north of Pyongyang. One Soviet-supplied IRT-2000 research reactor, completed in 1967. 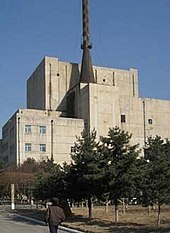 Uranium irradiated in this reactor was used in North Korea's first plutonium separation experiments in 1975. Nevertheless, the primary purpose of the reactor is not to produce plutonium and North Korea has had trouble acquiring enough fuel for constant operation. The U.S. Department of Energy estimated that this reactor could have been used to produce up to 1–2 kg of plutonium, though the Joint Atomic Energy Intelligence Committee said that the amount was no more than a few hundred grams. A newer nuclear reactor with a capacity of 5 MWe. This gas-graphite moderated Magnox type reactor is North Korea's main reactor, where practically all of its plutonium has been produced. A full core consists of 8,000 fuel rods and can yield a maximum of 27–29 kg of plutonium if left in the reactor for optimal burnup. The North Korean Plutonium Stock, Mid-2006, is estimated to be able to produce 0.9 grams of plutonium per thermal megawatt every day of its operation. The material required to make a single bomb is approximately four to eight kilograms. Often, North Korea has unloaded the reactor before reaching the maximum burnup level. There are three known cores which were unloaded in 1994 (under IAEA supervision in accordance with the Agreed Framework), 2005, and 2007. In 1989, the 5 MWe reactor was shut down for a period of seventy to a hundred days. In this time it is estimated that up to fifteen kilograms of plutonium could have been extracted. In 1994, North Korea unloaded its reactors again. The IAEA had these under full surveillance until later being denied the ability to observe North Korean power plants. Under normal operation, the reactor can produce about 6 kg of plutonium per year although the reactor would need to be shut down and the fuel rods extracted to begin the plutonium separation process. Hence, plutonium separation stages alternate with plutonium production stages. Reprocessing (also known as separation) is known to have taken place in 2003 for the first core and 2005 for the second core. Two Magnox reactors (50 MWe and 200 MWe), under construction at Yongbyon and Taechon. If completed, 50 MWe reactor would be capable of producing 60 kg of plutonium per year, enough for approximately 10 weapons and 200 MWe reactor 220 kg of plutonium annually, enough for approximately 40 weapons. Construction was halted in 1994 about a year from completion in accord with the Agreed Framework, and by 2004 the structures and pipework had deteriorated badly. Fuel reprocessing facility that recovers uranium and plutonium from spent fuel using the PUREX process. Based on extended Eurochemic reprocessing plant design at the Mol-Dessel site in Belgium. In 1994 its activity was frozen in accord with the Agreed Framework. On April 25, 2009, North Korean news agency KCNA, reported the resumption of reprocessing of spent fuel to recover plutonium. On March 12, 1993, North Korea said that it planned to withdraw from the Nuclear Non-Proliferation Treaty (NPT) and refused to allow IAEA inspectors access to its nuclear sites. By 1994, the United States believed that North Korea had enough reprocessed plutonium to produce about 10 bombs with the amount of plutonium increasing. Faced with diplomatic pressure after UN Security Council Resolution 825 and the threat of American military air strikes against the reactor, North Korea agreed to dismantle its plutonium program as part of the Agreed Framework in which South Korea and the United States would provide North Korea with light water reactors and fuel oil until those reactors could be completed. Because the light water reactors would require enriched uranium to be imported from outside North Korea, the amount of reactor fuel and waste could be more easily tracked, making it more difficult to divert nuclear waste to be reprocessed into plutonium. However, the Agreed Framework was mired in difficulties, with each side blaming the other for the delays in implementation; as a result, the light water reactors were never finished. In late 2002, after fuel aid was suspended, North Korea returned to using its old reactors. Kiljugun – Extensive military buildup with motorized troop formations and construction of new advanced underground facility – Site of May 25, 2009, Nuclear Test. 2. Chagangdo Province – one site: Kanggyesi – Production center of North Korea's advanced equipment and munitions since 1956. Also, extensive intelligence of highly advanced underground facility. 4. Pyongan Namdo (South Pyongan) Province – one site: Pyongsungsi – Location of National Science Academy and extensive underground facility whose purpose is not known. North Korea possesses uranium mines containing an estimated 4 million tons of high-grade uranium ore.
Prime minister Benazir Bhutto of Pakistan allegedly, through Pakistan's former top scientist, Abdul Qadeer Khan, supplied key data, stored on CDs, on uranium enrichment and information to North Korea in exchange for missile technology around 1990–1996, according to U.S. intelligence officials. President Pervez Musharraf and Prime minister Shaukat Aziz acknowledged in 2005 that Khan had provided centrifuges and their designs to North Korea. In May 2008, Khan, who had previously confessed to supplying the data on his own initiative, retracted his confession, claiming that the Pakistan Government forced him to be a "scapegoat". He also claimed that North Korea's nuclear program was well advanced before his visits to North Korea. Highly enriched uranium (HEU) program was publicized in October 2002 when the United States asked North Korean officials about the program. Under the Agreed Framework, North Korea explicitly agreed to freeze plutonium programs (specifically, its "graphite moderated reactors and related facilities"). The agreement also committed North Korea to implement the Joint Declaration on the Denuclearization of the Korean Peninsula, in which both Koreas committed not to have enrichment or reprocessing facilities. The United States argued North Korea violated its commitment not to have enrichment facilities. In December 2002, claiming North Korean non-compliance, the United States persuaded the KEDO Board to suspend fuel oil shipments, which led to the end of the Agreed Framework. North Korea responded by announcing plans to reactivate a dormant nuclear fuel processing program and power plant north of Pyongyang. North Korea soon thereafter expelled United Nations inspectors and announced a unilateral "withdrawal" from the Non-Proliferation Treaty. In 2007, a Bush administration official assessed that, while there was still a "high confidence" that North Korea acquired materials that could be used in a "production-scale" uranium program, there is only a "mid-confidence" level such a production-scale uranium (rather than merely plutonium) program exists. Construction of the probable first uranium enrichment facility started in 2002 at a site known as Kangson/Chollima by US intelligence, and could have been completed and developing or operating initial gas centrifuge cascades in 2003. The facility was suspected by US intelligence for many years. The Pyongsan Uranium Mine and Concentration Plant in Pyongsan is reported to be where uranium ore is turned into yellowcake. On August 8, 2017, the Washington Post reported recent analysis completed the previous month by the U.S. Defense Intelligence Agency which concluded that North Korea had successfully produced a miniaturized nuclear warhead that can fit in missiles and could have up to 60 nuclear warheads in its inventory. On August 7, 2017, Siegfried S. Hecker, former director of the Los Alamos National Laboratory who has visited North Korea nuclear facilities many times on behalf of the U.S., estimated that North Korea's stockpile of plutonium and highly enriched uranium was probably sufficient for 20 to 25 nuclear weapons. He assessed that North Korea had developed a miniaturized warhead suitable for medium-range missiles, but would need further tests and development to produce a smaller and more robust warhead suitable for an intercontinental ballistic missile (ICBM) and re-entry into the atmosphere. He considered the warhead as the least developed part of North Korea's plans for an ICBM. As of 2012, the Federation of American Scientists estimated North Korea had fewer than 10 plutonium warheads. As of January 2013, the Stockholm International Peace Research Institute estimated North Korea had 6 to 8 warheads. As of 8 January 2018, Hans M. Kristensen and Robert S. Norris of the Federation of American Scientists published in the Bulletin of the Atomic Scientists that they "cautiously estimate that North Korea may have produced enough fissile material to build between 30 and 60 nuclear weapons, and that it might possibly have assembled 10 to 20.". North Korea began to develop its own chemical industry and chemical weapon (CW) program in 1954, immediately following the end of the Korean War. However, substantial progress was not made until the 1960s, when Kim Il-sung "issued a 'Declaration for Chemicalization' whose aim was to further develop an independent chemical industry capable of supporting various sectors of its economy, as well as support chemical weapons production" and established North Korea's Nuclear and Chemical Defense Bureau. In the late 1960s and early 1970s, North Korea received Soviet and Chinese aid in developing its chemical industry. In 1979, the U.S. Defense Intelligence Agency believed that North Korea "had only a defensive CW capability." It is unclear when North Korea "acquired the capability for independent CW production"; estimates range from the 1970s to early 1980s. However, by the late 1980s, North Korea's CW capabilities had expanded; the South Korean Ministry of National Defense reported in 1987 that the North "possessed up to 250 metric tons of chemical weapons" including mustard (a blister agent) and some nerve agents. In 2009 the International Crisis Group reported that the consensus expert view was that North Korea had a stockpile of about 2,500 to 5,000 metric tons of chemical weapons, including mustard gas, sarin (GB) and other nerve agents. The South Korean Ministry of National Defense had the same estimate in 2010. In 2014, the South Korean Defense Ministry estimated that "the North had stockpiled 2,500 to 5,000 tons of chemical weapons and had a capacity to produce a variety of biological weapons." In 2015, the U.S. Department of Defense reported to Congress that North Korea's CW program "likely possesses a CW stockpile" and likely had "the capability to produce nerve, blister, blood, and choking agents." The report also found that "North Korea probably could employ CW agents by modifying a variety of conventional munitions, including artillery and ballistic missiles. In addition, North Korean forces are prepared to operate in a contaminated environment; they train regularly in chemical defense operations." The report indicated that North Korea "continues to develop its biological research and development capabilities" and "may consider the use of biological weapons as an option, contrary to its obligations under the Biological and Toxins Weapons Convention." North Korea is a signatory to the Geneva Protocol, which prohibits the use of chemical weapons in warfare. North Korea is also a signatory to the Biological Weapons Convention (BWC). Although the nation has signed the BWC, it "has failed to provide a BWC Confidence-Building Measure declaration since 1990." North Korea is not a party to the Chemical Weapons Convention (CWC). It is one of four countries that have not ratified the CWC (the others are Israel, Egypt, and South Sudan). North Korea has refused to acknowledge possessing chemical weapons, as called for by United Nations Security Council Resolution 1718, passed in 2006. After the 2010 bombardment of Yeonpyeong (in which North Korea attacked Yeonpyeong Island with conventional weapons, killing a number of civilians), the National Emergency Management Agency of South Korea distributed 1,300 gas masks to South Koreans living in the western border (a flashpoint for conflict); the agency also distributed another 610,000 gas masks to members of the South Korean civil defense corps, which numbers 3.93 million. The agency also announced the renovation of underground emergency shelters. Gas masks are effective against some chemical agents, but not against blister agents such as mustard gas, Lewisite, and Phosgene oxime, which North Korea is thought to have in its stockpiles. In October 2013, South Korea and the United States "agreed to build a joint surveillance system to detect biochemical agents along the demilitarized zone" and to share information. Throughout the years, several researchers, mostly South Korean, have concluded that the Pyongyang Bio-technical Institute, a factory supposedly for the production of bacillus thuringiensis of use in pesticides, actually produces weaponized anthrax. Hanham noted that pesticide production factories are "an old and well-used cover for a biological weapons program" and an example of dual-use technology. A number of other experts agreed that "the photos most likely show an operational biological weapons facility." The North Korean government denied the allegations; an official spokesperson for the National Defence Commission, through the official Korean Central News Agency, challenged the U.S. Congress to inspect the Institute and "behold the awe-inspiring sight of the Pyongyang Bio-technical Institute." North Korea possesses various types of chemical weapons, including nerve, blister, blood, and vomiting agents, as well as some biological weapons, including anthrax, smallpox, and cholera. In 2017, Kim Jong-nam, the estranged elder half-brother of Kim Jong-un, was assassinated with VX nerve agent at Kuala Lumpur International Airport in Malaysia by suspected North Korean agents. The identified stockpile is between 2,500 and 5,000 metric tons of chemical weapons. It is one of the world's largest possessors of chemical weapons, ranking third after the United States and Russia. In the 1960s, DPRK first received shipments of short-range ballistic missiles from its main ally, the Soviet Union. The first weapons of this kind to be delivered were the tactical FROG-series. In the late 1970s or early 1980s, the DPRK received several longer range Scud-B missiles from Egypt (which in turn received those missiles from the USSR, Bulgaria and Poland). The USSR had refused to supply Scuds to North Korea, but North Korea has produced missiles based on its design. A local production basis was established, and the first modified copy was named Hwasong-5. With time, more advanced types of missiles were developed. Eventually North Korea equipped itself with ballistic missiles, capable of reaching Japan. In the 1990s, North Korea sold medium-sized nuclear capable missiles to Pakistan in a deal facilitated by China. North Korea's ability to deliver weapons of mass destruction to a hypothetical target is somewhat limited by its missile technology. In 2005, North Korea's total range with its Nodong missiles was estimated as 900 km with a 1,000 kg payload. That is enough to reach South Korea, and parts of Japan, Russia, and China. The Hwasong-10 is a North Korean designed intermediate-range ballistic missile with range capabilities of up to 2,490 km (1,550 mi), and could carry a nuclear warhead. In an online interview published in 2006, the Japanese Ministry of Defense's analyst Hideshi Takesada argued that North Korea's desire of unification is similar to North Vietnam, and warned of the possibility of North Korea's compulsory merger with South Korea by threats of nuclear weapons, taking advantage of any possible decrease in the U.S. military presence in South Korea, after North Korea deploys several hundred mobile ICBMs aimed at the United States. In 2016, Israeli analyst Uzi Rubin said that the missile program had demonstrated "remarkable achievements". There is evidence that North Korea has been able to miniaturize a nuclear warhead for use on a ballistic missile. Whether North Korea has technology to protect their missiles upon re-entry is unknown. Some analysts suggest North Korea's new missiles are fakes. Various North Korean rocket tests continued into the 2010s, for example in 2013, in 2014, and in 2016. North Korea performed no tests of medium-range missiles sufficiently powerful to reach Japan in 2015, but South Korea's Yonhap news agency believes that at least one missile fired during North Korea's March 2016 missile tests is likely a medium-range Rodong missile. North Korea appeared to launch a missile test from a submarine on April 23, 2016; while the missile only traveled 30 km, one U.S. analyst noted that "North Korea's sub launch capability has gone from a joke to something very serious". An August 2016 North Korean missile test of a Rodong missile that flew 1,000 kilometres (620 mi) landed about 250 kilometres (160 mi) west of Japan's Oga Peninsula, in international waters but inside Japan's exclusive economic zone, prompting Japan to condemn the "unforgivable act of violence toward Japan's security". As of 2016, North Korea is known to have approximately 300 Rodong missiles whose maximum range is 1,300 km (800 mi). Hwasong-5 – initial Scud modification. Road-mobile, liquid-fueled missile, with an estimated range of 330 km. It has been tested successfully. It is believed that North Korea has deployed some 150–200 such missiles on mobile launchers. Hwasong-6 – later Scud modification. Similar to the Hwasong-5, yet with an increased range (550–700 km) and a smaller warhead (600–750 kg). Apparently this is the most widely deployed North Korean missile, with at least 400 missiles in use. Hwasong-7 – larger and more advanced Scud modification. Liquid-fueled, road-mobile missile with a 650 kg warhead. First production variants had inertial guidance, later variants featured GPS guidance, which improves CEP accuracy to 190–250 m. Range is estimated to be between 1,300 and 1,600 km. Hwasong-9 is also known as Scud-ER in rest of the world is further development of Hwasong-6 with range of (1000–1000+ km) and is capable of hitting Japan. Hwasong-10 – believed to be a modified copy of the Soviet R-27 Zyb SLBM. Originally believed to have been tested as the first or second stage of Unha, but debris analysis showed that the Unha used older technology than it is believed the Hwasong-10 uses. Also known under the names Nodong-B, Taepodong-X, Musudan and BM25, predicted to have a range of 2,500–4,000 km. A DoD report puts BM25 strength at fewer than 50 launchers. Hwasong-11 – a short-range, solid-fueled, highly accurate mobile missile, modified copy of the Soviet OTR-21. Unknown number in service, apparently deployed either in the late 1990s or early 2000s (decade). Pukkuksong-1 – a long-range, solid-fueled, SLBM. Also called the KN-11 by the Defense Department. Possibly derived from the Chinese JL-1 SLBM. Pukkuksong-2 – a long-range, land based development of the solid fueled Pukkuksong-1. Also known as the KN-15. Hwasong-12 – a medium-range, liquid-fueled, mobile missile. First tested in May 2017. also known as KN-17 outside of Korea, South Korean experts estimate range of 5000 to 6000 km based on successful test conducted in May. Hwasong-14 – Also known as the KN-20, a long-range, road transportable ICBM, tested on July 4 and 29, 2017, estimated range is 6,700–10,000 km (4,200–6,200 mi) John Schilling estimates the current accuracy of the North's Hwasong-14 as poor at the mooted ranges which threaten US cities (which would require more testing to prove its accuracy). Michael Elleman has pointed out that the NHK video which captured the descent of the reentry vehicle (RV) shows its failure to survive reentry. If the RV had survived reentry, the video would have shown a bright image all the way to impact in the sea. However a recent CIA assessment notes that North Korea’s ICBM reentry vehicles would likely perform adequately if flown on a normal trajectory to continental U.S. targets. Hwasong-15 - 13,000 km range, successfully tested on 28 November 2017. 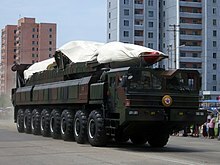 KN-08 – Road-mobile ICBM. Also called the Hwasong-13 (HS-13). Maximum range >5,500 km (3,400 miles). The US Defense Department estimates at least 6 KN-08 launchers are in deployment. A modified version, the KN-14, was unveiled at a parade marking the 70th anniversary of the Workers Party of Korea. The missile development was halted due to engine problems. In April 2009, the United Nations named the Korea Mining and Development Trading Corporation (KOMID) as North Korea's primary arms dealer and main exporter of equipment related to ballistic missiles and conventional weapons. The UN lists KOMID as being based in the Central District, Pyongyang. However, it also has offices in Beijing and sales offices worldwide which facilitate weapons sales and seek new customers for North Korean weapons. KOMID has sold missile technology to Iran and has done deals for missile related technology with the Taiwanese. KOMID has also been responsible for the sale of equipment, including missile technologies, gunboats, and multiple rocket artilleries, worth a total of over $100 million, to Africa, South America, and the Middle East. North Korea's military has also used a company called Hap Heng to sell weapons overseas. Hap Heng was based in Macau in the 1990s to handle sales of weapons and missile and nuclear technology to nations such as Pakistan and Iran. Pakistan's medium-range ballistic missile, the Ghauri, is considered to be a copy of North Korea's Rodong 1. In 1999, intelligence sources claim that North Korea had sold missile components to Iran. Listed directors of Hap Heng include Kim Song in and Ko Myong Hun. Ko Myong Hun is now a listed diplomat in Beijing and may be involved in the work of KOMID. A UN Security Council sanctions committee report stated that North Korea operates an international smuggling network for nuclear and ballistic missile technology, including to Myanmar (Burma), Syria, and Iran. Several countries have bought North Korean ballistic missiles or have received assistance from North Korea to establish local missile production. Egypt has received technologies and assistance for manufacture of both the Hwasong-5 and Hwasong-6, and may have provided guidance systems or information on longer-range missiles to North Korea from the Condor/Badr program. Iran was one of the first countries to buy North Korean missiles. Iran has established local production for the Hwasong-5 (Shahab-1), Hwasong-6 (Shahab-2) and the Rodong-1 (Shahab-3). Iran also possesses 19 land-based BM25 Musudan missiles, according to a leaked, classified U.S. State Department cable, Iran designated the Musudan as Khorramshahr (missile). This nuclear-capable missile is currently under development and failed its two known flight tests. North Korean entities continued to provide assistance to Pakistan's ballistic missile program during the first half of 1999 in return for nuclear weapons technology. Such assistance was critical to Islamabad's efforts to produce ballistic missiles. In April 1998, Pakistan flight-tested the Ghauri MRBM, which is based on North Korea's Nodong missile. Also in April 1998, the United States imposed sanctions against Pakistani and North Korean entities for their role in transferring Missile Technology Control Regime Category I ballistic missile-related technology. Syria originally obtained the SCUD-B from North Korea. North Korea may have assisted Syria in development of the SCUD-C and/or the SCUD-D. As of 2013, Syria relies on foreign assistance from multiple countries, including North Korea, for advanced missile components and technologies. In 2018, a United Nations report alleged that North Korea had been sending technicians and material to Syria to assist in its chemical weapons program, including acid-resistant tiles, valves, and thermometers. 25 Hwasong-5s were purchased from North Korea in 1989. The UAE Union Defence Force were not satisfied with the quality of the missiles, and they were kept in storage. Vietnam reportedly ordered Hwasong-5/6 missiles in 1998-99, but it is unclear if this deal was fulfilled. Yemen is known to have bought Scud missiles from the DPRK in the 1990s—a total of 15 missiles, conventional warheads and fuel oxidizer. Libya during the rule of Muammar Gaddafi had been known to receive technological assistance, blueprints and missile parts from North Korea. In January 2004, the Nigerian government announced that North Korea had agreed to sell its missile technology, but a month later Nigeria rejected the agreement under U.S. pressure. In the 1990s, the United States negotiated the Agreed Framework to freeze North Korea's nuclear weapons program while pursuing the denuclearization of the Korean peninsula. This broke down when North Korea's clandestine uranium enrichment program came to light in 2002, after which China convened the Six-party talks to negotiate a step-by-step process to denuclearization. The Six-party talks stalled after multiple North Korean nuclear and missile tests, leading to increased international Sanctions against North Korea, including a series of sanctions resolutions imposed by the United Nations Security Council. In 2018, Presidents Moon Jae-in of South Korea and Donald Trump of the United States held a series of summits with Kim Jong-un which led to declarations in favor of the denuclearization of the Korean peninsula. On October 31, 2018, lawmaker Kim Min-ki of South Korea's ruling Democratic Party of Korea issued a statement revealing that officials from South Korea's National Intelligence Service had observed several of North Korea's nuclear and missile test sites and that they were now ready for the upcoming international inspections. Kim also stated that the now inactive North Korean Punggye-ri Nuclear Test Site and the Sohae Satellite launching ground were included in these observations. The visit by the intelligence officials was in tandem with the September 2018 Pyongyang Agreement, which saw North Korean leader Kim Jung-Un agree to close Sohae and allow international experts to observe the dismantling of the missile engine testing site and a launch pad. The international experts will also be allowed to witness the dismantling of other North Korean nuclear and missile test sites as well. Yongbyon, the main nuclear facility in North Korea, has also been inactive during the past year as well, but has not yet completely closed. ^ Yield is always disputed, since North Korea does not announce the exact amount after its tests. ^ Maximum range is always disputed, since North Korea rarely tests its missiles at maximum range. ^ "North Korea: Tremor was sixth nuclear test, says Japan". BBC News. September 3, 2017. Archived from the original on September 3, 2017. Retrieved September 3, 2017. ^ "North Korea nuclear test: what we know so far". The Guardian. September 3, 2017. ^ "The nuclear explosion in North Korea on 3 September 2017: A revised magnitude assessment". NORSAR. September 12, 2017. Retrieved September 13, 2017. ^ a b "North Korea's Nuclear Capabilities: A Fresh Look | Institute for Science and International Security". isis-online.org. Retrieved May 15, 2017. ^ "North Korea's Longest Missile Test Yet". November 28, 2017. Retrieved June 11, 2018. ^ a b c d e f g Military and Security Developments Involving the Democratic People's Republic of Korea: A Report to Congress Pursuant to the National Defense Authorization Act for Fiscal Year 2012 (PDF) (Report). U.S. Department of Defense. 2012. pp. 21–22. Archived (PDF) from the original on February 25, 2017. ^ "North Korea leaves nuclear pact". CNN.com. January 10, 2003. Archived from the original on February 6, 2016. ^ a b John Pike. "Nuclear Weapons Program". globalsecurity.org. Archived from the original on March 2, 2010. ^ a b c d e f g "Fact Sheet on DPRK Nuclear Safeguards". iaea.org. Archived from the original on September 1, 2013. ^ The U.S.-North Korean Agreed Framework at a Glance Archived December 1, 2010, at the Wayback Machine Fact Sheet, Arms Control Association. ^ "Archived copy". Archived from the original on December 1, 2016. Retrieved December 17, 2016. CS1 maint: Archived copy as title (link) additional text. ^ "Non-Proliferation Treaty". Dosfan.lib.uic.edu. October 21, 1994. Archived from the original on March 6, 2012. Retrieved March 1, 2012. ^ "Archived copy". Archived from the original on June 9, 2009. Retrieved November 28, 2010. CS1 maint: Archived copy as title (link) additional text. ^ "North Korea Confirms It Has Nuclear Weapons". Fox News. February 11, 2005. Archived from the original on May 26, 2013. Retrieved March 8, 2013. ^ Traynor, Ian; Watts, Jonathan; Borger, Julian (September 20, 2005). "North Korea vows to abandon nuclear weapons project". The Guardian. London. Archived from the original on August 29, 2013. Retrieved March 8, 2013. ^ Burns, Robert; Gearan, Anne (October 13, 2006). "U.S.: Test Points to N. Korea Nuke Blast". The Washington Post. Archived from the original on December 27, 2016. ^ "North Korea Nuclear Test Confirmed by U.S. Intelligence Agency". Bloomberg. October 16, 2006. Archived from the original on September 30, 2007. Retrieved October 16, 2006. ^ a b "Usher in a great heyday of Songun Korea full of confidence in victory". The Pyongyang Times. January 6, 2007. p. 1. ^ "UN confirms N Korea nuclear halt". BBC News. July 16, 2007. Archived from the original on August 27, 2007. Retrieved July 16, 2007. ^ Richard Lloyd Parry (April 24, 2009). "North Korea is fully fledged nuclear power, experts agree". The Times (Tokyo). London. Archived from the original on May 25, 2010. Retrieved December 1, 2010. ^ "North Korea's new nuclear test raises universal condemnation". NPSGlobal Foundation. May 25, 2009. Archived from the original on March 21, 2011. Retrieved December 1, 2010. ^ a b Steven Lee Myers; Choe Sang-Hun (February 29, 2012). "North Korea Agrees to Curb Nuclear Work; U.S. Offers Aid". The New York Times. Archived from the original on March 1, 2012. Retrieved February 29, 2012. ^ "DPRK Foreign Ministry Spokesman on Result of DPRK-U.S. Talks". Korean Central News Agency. February 29, 2012. Archived from the original on March 4, 2012. Retrieved March 3, 2012. ^ "U.S.-DPRK Bilateral Discussions". U.S. Department of State. February 29, 2012. Archived from the original on March 2, 2012. Retrieved March 3, 2012. ^ "US stops food aid to North Korea after missile launch". Reuters. April 13, 2012. Archived from the original on October 16, 2015. ^ February 12, 2013 02:57:51 (mb 5.1) North Korea 41.3 129.1 (4cc01) (Report). USGS. February 11, 2013. Archived from the original on February 13, 2013. Retrieved February 12, 2013. ^ "North Korea appears to conduct 3rd nuclear test, officials and experts say". CNN. February 12, 2013. Archived from the original on February 12, 2013. Retrieved February 12, 2013. ^ Choi He-suk (February 14, 2013). "Estimates differ on size of N.K. blast". The Korea Herald. Archived from the original on February 16, 2013. Retrieved February 17, 2013. ^ "Nuke test air samples are a bust". February 15, 2013. Archived from the original on May 23, 2013. Retrieved February 16, 2013. ^ "How Powerful Was N.Korea's Nuke Test?". The Chosun Ilbo. February 14, 2013. Archived from the original on February 17, 2013. Retrieved February 17, 2013. ^ a b Nordkorea: BGR registriert vermutlichen Kernwaffentest – BGR, January 6, 2016. ^ M5.1 – 21 km ENE of Sungjibaegam, North Korea (Report). USGS. January 6, 2016. Archived from the original on January 7, 2016. Retrieved January 6, 2016. ^ "North Korea claims fully successful hydrogen bomb test". Russia Today. January 5, 2016. Archived from the original on January 6, 2016. Retrieved January 5, 2016. ^ a b c "News from The Associated Press". hosted.ap.org. Archived from the original on February 6, 2016. ^ "N Korean nuclear test condemned as intolerable provocation". Channel News Asia. Mediacorp. January 6, 2016. Archived from the original on January 7, 2016. Retrieved January 6, 2016. ^ Windrem, Robert. "North Korea Likely Lying About Hydrogen Bomb Test, Experts Say". NBC News. Archived from the original on January 6, 2016. Retrieved January 6, 2016. ^ a b Nordkorea: BGR registriert vermutlichen Kernwaffentest – BGR (In German), September 9, 2016. ^ "North Korea fires long-range rocket despite warnings". BBC News. Archived from the original on February 8, 2016. Retrieved February 8, 2016. ^ "North Korea conducts 'fifth and biggest nuclear test'". BBCNews. September 9, 2016. Archived from the original on September 9, 2016. ^ Richard Roth; Holly Yan & Ralph Ellis. "North Korea hit with tough sanctions by U.N." CNN. Archived from the original on July 1, 2016. Retrieved July 11, 2017. ^ a b CNN, Zachary Cohen and Barbara Starr (July 28, 2017). "North Korea launches second long-range ICBM missile". CNN. Archived from the original on July 28, 2017. Retrieved July 28, 2017. ^ "To React to Nuclear Weapons in Kind Is DPRK's Mode of Counteraction: Rodong Sinmun". Korean Central News Agency. January 11, 2016. Archived from the original on February 6, 2016. Retrieved January 11, 2016. ^ "North's Korea Nuclear Weapon Program" (PDF). US Department of State. Archived from the original (PDF) on December 12, 2016. ^ "North's Korea Choice: Bombs over Electricity" (PDF). Archived from the original (PDF) on January 2, 2014. Retrieved August 31, 2013. ^ "Analyses - Examining The Lessons Of The 1994 U.s.-North Korea Deal - Kim's Nuclear Gamble - FRONTLINE". PBS. August 31, 1998. Retrieved March 14, 2018. ^ United States. Congress. House. Committee on International Relations. Subcommittee on Asia and the Pacific; United States. Congress. House. Committee on International Relations. Subcommittee on International Terrorism and Nonproliferation (2005). The North Korean nuclear challenge: is there a way forward? : joint hearing before the Subcommittee on Asia and the Pacific and the Subcommittee on International Terrorism and Nonproliferation of the Committee on International Relations, House of Representatives, One Hundred Ninth Congress, first session, February 17, 2005. U.S. G.P.O. p. 35. ^ "Confronting Ambiguity: How to Handle North Korea's Nuclear Program". Arms Control Association. March 9, 2018. Retrieved March 14, 2018. ^ a b c "North Korea's nuclear tests". BBC News. Archived from the original on August 21, 2013. ^ "SECURITY COUNCIL CONDEMNS NUCLEAR TEST BY DEMOCRATIC PEOPLE'S REPUBLIC OF KOREA, UNANIMOUSLY ADOPTING RESOLUTION 1718 (2006) - Meetings Coverage and Press Releases". Welcome to the United Nations. October 14, 2006. Retrieved March 14, 2018. ^ Glenn Kessler, Far-Reaching U.S. Plan Impaired N. Korea Deal Archived May 20, 2017, at the Wayback Machine: Demands Began to Undo Nuclear Accord, The Washington Post, p. A20, September 26, 2008. ^ Demetri Sevastopulo (October 10, 2008). "Bush removes North Korea from terror list". Financial Times. Archived from the original on October 12, 2008. Retrieved October 10, 2008. ^ "N. Korea Says It Has Restarted Nuclear Facilities list". Fox News. Associated Press. April 25, 2009. Archived from the original on April 26, 2009. Retrieved April 25, 2009. ^ Russia Today (April 26, 2009). "North Korea: return of the nukes". RT. Archived from the original on April 27, 2009. Retrieved May 22, 2009. ^ "N. Korea Says It Conducted 2nd Nuclear Test". Fox News. Associated Press. May 25, 2009. Archived from the original on May 26, 2009. Retrieved May 25, 2009. ^ McCurry, Justin (May 12, 2010). "North Korea claims nuclear fusion breakthrough". The Guardian. Retrieved June 8, 2018. ^ De Geer, Lars-Erik (2012). "Radionuclide Evidence for Low-Yield Nuclear Testing in North Korea in April/May 2010" (PDF). Science & Global Security. 20 (1): 1–29. doi:10.1080/08929882.2012.652558. ISSN 0892-9882. ^ Brumfiel, Geoff (February 3, 2012). "Isotopes hint at North Korean nuclear test". Nature. doi:10.1038/nature.2012.9972. ISSN 1744-7933. ^ Pappalardo, Joe (November 14, 2017). "Did North Korea Really Light Up a Nuke in 2010?". Popular Mechanics. Retrieved June 8, 2018. ^ De Geer, Lars-Erik (May 19, 2015). "The Great 2010 DPRK Nuclear Test Debate: Summarizing the Evidence". 38 North. Retrieved June 8, 2018. ^ "2010 Korea bomb 'tests' probably false alarms, says study". EurekAlert!. October 8, 2012. Retrieved June 8, 2018. ^ Zhang, M.; Wen, L. (November 19, 2014). "Seismological Evidence for a Low-Yield Nuclear Test on 12 May 2010 in North Korea". Seismological Research Letters. 86 (1): 138–145. doi:10.1785/02201401170. ISSN 0895-0695. ^ Kim, Won‐Young; Richards, Paul G.; Schaff, David P.; Koch, Karl (December 20, 2016). "Evaluation of a Seismic Event, 12 May 2010, in North Korea". Bulletin of the Seismological Society of America. 107 (1): 1–21. doi:10.1785/0120160111. ISSN 0037-1106. ^ "North Korean seismic event of May 2010 likely was earthquake, not nuclear test". Phys.org. May 12, 2010. Retrieved June 8, 2018. ^ "朝鲜(疑爆)Ms4.9地震" (in Chinese). Archived from the original on August 9, 2014. ^ "Press Release: On the CTBTO's detection in North Korea". CTBTO. Archived from the original on February 15, 2013. Retrieved February 12, 2013. ^ "North Korea confirms 'successful' nuclear test". The Telegraph. London, England. February 12, 2013. Archived from the original on January 6, 2016. Retrieved January 6, 2016. ^ "Miao Zhang and Lianxing Wen (2013) "High-precision location and yield of North Korea's 2013 nuclear test"" (PDF). Retrieved June 11, 2018. ^ "North Korea has a hydrogen bomb, says Kim Jong-un". The Guardian. Reuters. December 10, 2015. Archived from the original on January 6, 2016. Retrieved January 6, 2016. ^ Sang-hun, Choe (December 10, 2015). "Kim Jong-Un's Claim of North Korea Hydrogen Bomb Draws Skepticism". The New York Times. Archived from the original on January 9, 2016. Retrieved January 6, 2016. ^ Siobhan Fenton (January 6, 2016). "North Korea hydrogen bomb test: Experts cast doubt on country's claims". The Independent. Archived from the original on January 7, 2016. ^ no by-line.--> (January 6, 2016). "North Korea nuclear H-bomb claims met by scepticism". BBC News Asia. BBC. Retrieved January 6, 2016. ^ "North Korea shows off its 'true nuclear deterrent'". March 9, 2016. Archived from the original on March 13, 2016. ^ CNN, Steve Almasy and Euan McKirdy. "North Korea claims miniature nuclear warheads". Archived from the original on March 20, 2017. ^ no by-line.-->. "N Korean nuclear test condemned as intolerable provocation". Channel News Asia. Mediacorp. Retrieved January 6, 2016. ^ "North Korea's Hydrogen Bomb Claim Strains Ties With China". The New York Times. January 7, 2016. Archived from the original on April 10, 2016. ^ "Seoul says North Korea conducted 5th nuclear test". Fox News. September 9, 2016. Retrieved March 18, 2017. ^ a b "North Korea nuclear test: Japan confirms huge quake caused by explosion". The Guardian. September 9, 2016. Archived from the original on September 17, 2016. ^ Sang-Hun, Choe. "China Suspends All Coal Imports From North Korea Archived April 25, 2017, at the Wayback Machine", The New York Times, February 18, 2017. Retrieved July 10, 2017. ^ "North Korea: Four ballistic missiles fired into sea". BBC News. March 6, 2017. Archived from the original on March 5, 2017. Retrieved March 6, 2017. ^ "Rex Tillerson urged to be 'cool-headed' over North Korea". BBC News. March 18, 2017. Archived from the original on March 18, 2017. Retrieved March 18, 2017. ^ "Analysis: Afghanistan strike may boost Trump, send message to North Korea". USA TODAY. Archived from the original on April 14, 2017. Retrieved April 14, 2017. ^ Davis, William J. Broad, Kenan; Patel, Jugal K. (April 12, 2017). "North Korea May Be Preparing Its 6th Nuclear Test". Archived from the original on April 14, 2017 – via NYTimes.com. ^ Sputnik. "New North Korea Missile Launches Not Ruled Out Soon – Russian Ambassador". Archived from the original on April 19, 2017. ^ Diplomat, Damen Cook, The. "Test or No Test, the List of Options in North Korea Is Quickly Narrowing". Archived from the original on April 16, 2017. ^ Diplomat, Ankit Panda, The. "North Korea's 2017 Military Parade Was a Big Deal. Here Are the Major Takeaways". Archived from the original on May 1, 2017. ^ "North Korea shows off new missiles in huge military parade, but doesn't test nuke". Archived from the original on April 28, 2017. ^ Tokyo, Tom Phillips Justin McCurry in; Graham-Harrison, Emma (April 15, 2017). "North Korea parades military might and warns US amid nuclear test fears". Archived from the original on April 29, 2017 – via The Guardian. ^ CNN, Brad Lendon. "North Korea surprises with display of new missiles". Archived from the original on April 30, 2017. ^ Millar, Joey (April 13, 2017). "Kim Jong-un SECRET WEAPON: North Korea's hidden SUBMARINE threat amid nuclear attack plan". ^ Daniels, Jeff (April 12, 2017). "North Korea's hidden submarine threat as regime warns 'ready' for war". Archived from the original on May 1, 2017. ^ "North Korea shows off new missiles in display of military might vows to strike foes down". Archived from the original on May 3, 2017. ^ "N Korea missile launch fails day after military parade". BBC News. April 16, 2017. Archived from the original on April 15, 2017. Retrieved April 16, 2017. ^ "N. Korea didn't test a nuclear weapon, but it did try to launch another missile". Archived from the original on April 18, 2017. ^ "Tillerson: China threatens sanctions if North Korea continues nuclear tests". The Washington Times. April 27, 2016. Archived from the original on April 28, 2017. Retrieved April 28, 2016. ^ "A New North Korean Missile Test Ends in Failure". New York Times. Retrieved April 28, 2017. ^ Sang-hun, Choe (July 4, 2017). "NYT: North Korea says it has successfully tested ICBM". Archived from the original on July 4, 2017. Retrieved July 4, 2017. ^ "North Korea missile 'greatly exceeded' altitude of 2,500 km: Japan Defense Ministry". Archived from the original on July 6, 2017. Retrieved July 7, 2017. ^ https://www.facebook.com/mradamtaylor. "Analysis - The inevitability of North Korea's nuclear weapons". Washington Post. Archived from the original on July 28, 2017. ^ https://www.facebook.com/joby.warrick. "Experts: North Korea's missile was a 'real ICBM' — and a grave milestone". Washington Post. Archived from the original on July 5, 2017. ^ CNN, Joshua Berlinger. "North Korea missile lacks re-entry capability, South Korea says". CNN. Archived from the original on July 12, 2017. ^ a b "North Korea can hit most of United States: U.S. officials". August 1, 2017. Archived from the original on August 1, 2017 – via Reuters. ^ a b "What is True and Not True About North Korea's Hwasong-14 ICBM: A Technical Evaluation - 38 North: Informed Analysis of North Korea". July 10, 2017. Archived from the original on July 18, 2017. ^ "Video Casts Doubt on North Korea's Ability to Field an ICBM Re-entry Vehicle - 38 North: Informed Analysis of North Korea". July 31, 2017. Archived from the original on August 9, 2017. ^ Diplomat, Ankit Panda, The. "US Intelligence: North Korea's ICBM Reentry Vehicles Are Likely Good Enough to Hit the Continental US". Archived from the original on August 12, 2017. ^ Kim, Jack, and Soyoung Kim. "North Korea detonates its sixth and most powerful nuclear test yet". Reuters. Archived from the original on September 4, 2017. ^ "North Korea's latest nuclear test was so powerful it reshaped the mountain above it". The Washington Post. September 14, 2017. Archived from the original on September 14, 2017. Retrieved September 14, 2017. ^ "North Korea nuclear test: Hydrogen bomb 'missile-ready'". BBC News. September 3, 2017. Archived from the original on September 3, 2017. Retrieved September 3, 2017. ^ Trump: US to Redesignate North Korea as State Sponsor of Terror, Peter Heinlein, Voice of America, 21 November 2017. ^ Friedman, Uri (November 29, 2017). "North Korea Says It Has 'Completed' Its Nuclear Program". The Atlantic. The Atlantic Monthly Group. Retrieved June 12, 2018. ^ Kong, Kanga (November 28, 2017). "North Korea Says Nuke Push Complete as Entire U.S. in Range". Bloomberg. Retrieved June 12, 2018. ^ Joo, Seung-Hoo (2000). Gorbachev's Foreign Policy Toward the Korean Peninsula, 1985–1991: Power and Reform. E. Mellen Press. p. 205. ISBN 978-0-7734-7817-6. ^ Albright, David; Berkhout, Frans; Walker, William (1997). Plutonium and Highly Enriched Uranium, 1996: World Inventories, Capabilities, and Policies. Stockholm International Peace Research Institute. p. 303. ISBN 978-0-19-828009-5. ^ The North Korean Plutonium Stock, February 2007 Archived October 17, 2012, at the Wayback Machine by David Albright and Paul Brannan, Institute for Science and International Security (ISIS), February 20, 2007. ^ "Weapons of Mass Destruction". Archived from the original on November 11, 2012. Retrieved November 6, 2012. ^ "International Atomic Energy Agency (IAEA)". International Atomic Energy Agency. Archived from the original on October 25, 2012. Retrieved November 5, 2012. ^ Busch, Nathan E. (2004). No End in Sight: The Continuing Menace of Nuclear Proliferation. University Press of Kentucky. p. 251. ISBN 978-0-8131-2323-3. ^ Siegfried S. Hecker (May 12, 2009). "The risks of North Korea's nuclear restart". Bulletin of the Atomic Scientists. Archived from the original on July 15, 2009. Retrieved November 5, 2009. ^ "FSI – CISAC – North Korea's Choice: Bombs Over Electricity". stanford.edu. Archived from the original on December 5, 2010. Retrieved August 31, 2013. ^ "Defiant NKorea resumes nuclear program". Brisbane Times. April 25, 2014. Archived from the original on April 10, 2015. Retrieved October 16, 2014. ^ Bodansky, Yossef; Forrest, Vaughn S. (August 11, 1994). Pyongyang and the US nuclear gambit Archived August 10, 2009, at the Wayback Machine Congressional Documents. GlobalSecurity.org. ^ 북한내 핵실험 가능 추정지역 최소 8곳 [Minimum of eight nuclear test in North Korea can be estimated]. BreakNews (in Korean). October 6, 2006. Archived from the original on September 27, 2011. Retrieved November 1, 2009. ^ Nuclear Weapons Program – North Korea Archived October 16, 2015, at the Wayback Machine History section paragraph 1. Federation of American Scientists. Accessed April 5, 2013. ^ "Khan 'gave N Korea centrifuges'". BBC News. August 24, 2005. Archived from the original on May 31, 2009. Retrieved March 1, 2012. ^ "ABC News: ABC Exclusive: Pakistani Bomb Scientist Breaks Silence". ABC News. ABC News (USA). May 30, 2008. Archived from the original on October 1, 2012. Retrieved March 1, 2012. ^ "N Korea 'admits nuclear programme". BBC News. October 17, 2002. Archived from the original on August 22, 2006. Retrieved October 5, 2006. ^ Sanger, David E.; Broad, William J. (March 1, 2007). "U.S. Had Doubts on North Korean Uranium Drive". The New York Times. Archived from the original on April 16, 2009. Retrieved March 1, 2007. ^ Kessler, Glenn (March 1, 2007). "New Doubts on Nuclear Efforts by North Korea". The Washington Post. Archived from the original on April 11, 2007. Retrieved March 1, 2007. ^ Panda, Ankit (July 13, 2018). "Exclusive: Revealing Kangson, North Korea's First Covert Uranium Enrichment Site". The Diplomat. Retrieved July 16, 2018. ^ Pabian, Frank V.; Makowsky, Peter; Buck, Irv (November 2, 2018). "North Korea's Uranium Mining and Milling Operations Continue at Pyongsan". 38 North. Pyongsan is believed to be where North Korea turns ore into yellowcake, an intermediate step in the processing of uranium after it has been mined but before fuel fabrication or enrichment. ^ Elisabeth Eaves, Siegfried S. Hecker (August 7, 2017). "Hecker: Talk to North Korea to avert a nuclear disaster". Center for International Security and Cooperation. Stanford University. Archived from the original on September 11, 2017. Retrieved August 18, 2017. ^ David E. Sanger, William J. Broad (April 24, 2017). "As North Korea Speeds Its Nuclear Program, U.S. Fears Time Will Run Out". New York Times. Archived from the original on August 10, 2017. Retrieved August 18, 2017. ^ "North Korea's Estimated Stocks of Plutonium and Weapon-Grade Uranium" (PDF). August 16, 2012. Retrieved March 7, 2013. ^ "Nuclear weapons: Who has what?". CNN. Archived from the original on April 16, 2013. Retrieved April 16, 2013. ^ Daily chart: Mutually assured ambiguity Archived March 6, 2014, at the Wayback Machine The Economist (June 3, 2013). Retrieved July 12, 2013. ^ Kristensen, Hans M.; Norris, Robert S. (2018). "North Korean nuclear capabilities, 2018". Bulletin of the Atomic Scientists. 74: 41–51. doi:10.1080/00963402.2017.1413062. ^ a b c d e f g h i j k North Korea: Chemical Archived February 24, 2017, at the Wayback Machine Nuclear Threat Initiative (last updated December 2016). ^ Jon Herskovitz (June 18, 2009). "North Korea chemical weapons threaten region: report". Reuters. Archived from the original on October 16, 2015. ^ "Arms Control and Proliferation Profile: North Korea". Arms Control Association. November 2016. Archived from the original on February 25, 2017. ^ a b Richard C. Paddock, Choe Sang-Hun & Nicholas Wade, In Kim Jong-nam's Death, North Korea Lets Loose a Weapon of Mass Destruction Archived February 25, 2017, at the Wayback Machine New York Times (February 24, 2017). ^ Chemical Weapons Convention Signatories and States-Parties Archived September 3, 2017, at the Wayback Machine, Arms Control Association (updated June 2017). ^ a b c Asher-Schaprio, Avi (July 9, 2015). "Did North Korea Really Publish Pictures of a Biological Weapons Facility?". VICE News. Archived from the original on March 10, 2016. Retrieved January 11, 2016. ^ "Kim Jong-un invites entire US government to visit pesticide plant". The Daily Telegraph. July 15, 2015. Archived from the original on March 23, 2016. Retrieved January 11, 2016. ^ Monte, Louis A. Del (May 1, 2017). "North Korea's Chemical Weapons, Biological Weapons, And Nanoweapons". Archived from the original on May 2, 2017. ^ Loria, Kevin (July 27, 2017). "Everything we know about North Korea's bioweapons program". Archived from the original on August 12, 2017. ^ Lamothe, Dan; Morello, Carol (November 4, 2017). "Securing North Korean nuclear sites would require a ground invasion, Pentagon says". Retrieved November 5, 2017 – via www.WashingtonPost.com. ^ North Korean Security Challenges: A Net Assessment (London: The International Institute for Strategic Studies, 2011), p. 161. ^ a b c d Markus Schiller (2012). Characterizing the North Korean Nuclear Missile Threat (Report). RAND Corporation. ISBN 978-0-8330-7621-2. TR-1268-TSF. Archived from the original on December 5, 2012. Retrieved January 19, 2013. ^ Ravi Shekhar Narain Singh (2005). Asian Strategic And Military Perspective. Lancer Publishers. ISBN 978-8170622451. Archived from the original on January 2, 2016. ^ "Nikkei Interview Article Computer Translation". Excite-webtl.jp. Retrieved March 1, 2012. ^ Rubin, Uzi (August 11, 2016). "Remarkable achievements: North Korean missile programs are far from bluff". NK News. Archived from the original on January 18, 2017. ^ "How potent are North Korea's threats?". BBC News Online. September 15, 2015. ^ Shanker, Thom (April 11, 2013). "Pentagon Says Nuclear Missile Is in Grasp for North Korea". The New York Times. Archived from the original on April 12, 2013. Retrieved April 11, 2013. ^ Schneider, Mark. "Does North Korea Have a Missile-Deliverable Nuclear Weapon?". Archived from the original on September 21, 2016. ^ Eric Talmadge (April 26, 2012). "Analysts say North Korea's new missiles are fakes". The Independent. London. Archived from the original on April 29, 2012. Retrieved July 11, 2017. ^ Jack Kim; Ju-Min Park (March 17, 2016). "Defiant North Korea fires ballistic missile into sea, Japan protests". Reuters. Archived from the original on March 17, 2016. Retrieved March 18, 2016. ^ Don Melvin; Jim Sciutto (April 23, 2016). "North Korea launches missile from submarine". CNN. Archived from the original on April 24, 2016. Retrieved April 23, 2016. ^ Choe Sang-Hun (August 2, 2016). "North Korea Fires Ballistic Missile Into Waters Off Japan". New York Times. Archived from the original on August 5, 2016. Retrieved August 4, 2016. ^ a b "Japan: North Korea missile launch an "unforgivable act of violence"". July 27, 2016. Archived from the original on August 4, 2016. Retrieved August 4, 2016. ^ John Pike. "Rodong-1". Globalsecurity.org. Archived from the original on February 4, 2012. Retrieved March 1, 2012. ^ "Yonhapnews Agency - Mobile". m.yna.co.kr. Retrieved June 11, 2018. ^ "North Korea Launches Four Missiles "Simultaneously"". March 6, 2017. Retrieved June 11, 2018. ^ "North's Scud-ER can reach U.S. base in Japan". Korea JoongAng Daily. Retrieved June 11, 2018. ^ "Facts about North Korea's Musudan missile". AFP. GlobalPost. April 8, 2013. Archived from the original on April 9, 2013. Retrieved April 10, 2013. IHS Jane's puts the estimated range at anywhere between 2,500 and 4,000 kilometres … potential payload size has been put at 1.0–1.25 tonnes. ^ "Experts Suspect Chinese Assistance in N. Korean Submarine Missile Development". Archived from the original on September 7, 2016. ^ Schilling, John. "The Pukkuksong-2: A Higher Degree of Mobility, Survivability and Responsiveness | 38 North: Informed Analysis of North Korea". 38north.org. Archived from the original on February 23, 2017. Retrieved May 22, 2017. ^ Sang-hun, Choe (April 4, 2017). "North Korea Fires Ballistic Missile a Day Before U.S.-China Summit". The New York Times. Archived from the original on April 5, 2017. Retrieved May 22, 2017. ^ "US believes North Korea launched KN-17 missile". ABC News. May 15, 2017. Archived from the original on May 15, 2017. Retrieved May 15, 2017. ^ McCurry, Justin (July 4, 2017). "North Korea claims successful test of intercontinental ballistic missile". The Guardian. Archived from the original on July 4, 2017. Retrieved July 4, 2017. ^ "North Korea: Second ICBM test proves US in strike range". www.aljazeera.com. Archived from the original on August 9, 2017. Retrieved August 10, 2017. ^ "North Korea Appears to Launch Missile with 6,700 km Range". July 3, 2017. Archived from the original on July 4, 2017. ^ "N. Korea likely to have operational ICBM capable of striking U.S. West Coast next year or two: U.S. expert". Archived from the original on July 29, 2017. ^ Diplomat, Ankit Panda, The. "Why Is Russia Denying That North Korea Launched an ICBM?". Archived from the original on July 18, 2017. ^ Lewis, Jeffrey (July 10, 2017). "That's more or less our range estimate too -- 7,000-10,000 km". Archived from the original on July 18, 2017. ^ "Arms Control Wonk : North Korea's ICBM: Hwasong-14". armscontrolwonk.libsyn.com. Archived from the original on July 29, 2017. ^ "Arms Control Wonk : North Korea's New Missiles". www.armscontrolwonk.libsyn.com. Archived from the original on July 19, 2017. ^ "North Korean ICBM Appears Able to Reach Major US Cities". Archived from the original on July 29, 2017. ^ "What is True and Not True About North Korea's Hwasong-14 ICBM: A Technical Evaluation - 38 North: Informed Analysis of North Korea". July 10, 2017. Archived from the original on July 30, 2017. ^ Diplomat, Ankit Panda, The. "US Intelligence: North Korea's ICBM Reentry Vehicles Are Likely Good Enough to Hit the Continental US". The Diplomat. Archived from the original on August 28, 2017. Retrieved September 4, 2017. ^ North Korea’s Longest Missile Test Yet, David Wright, All Things Nuclear, Union of Concerned Scientists. ^ "日언론 "北, 화성-13형 개발 중단…연료 주입시간·출력 문제"". December 2, 2017. Retrieved June 11, 2018. ^ "komid-un". CNN. April 25, 2009. Archived from the original on January 25, 2012. Retrieved March 1, 2012. ^ "KOMID Overseas". Archived from the original on August 29, 2010. Retrieved August 29, 2010. ^ "KOMID and Iran". Archived from the original on October 11, 2010. Retrieved October 11, 2010. ^ "KOMID and Taiwan". Archived from the original on November 19, 2010. Retrieved November 19, 2010. ^ "Hap Heng in Macau". CNN. Archived from the original on September 24, 2012. Retrieved March 1, 2012. ^ 印務局 Internet Team. "Ko Myong Hun and Kim Song In". Bo.io.gov.mo. Archived from the original on February 24, 2012. Retrieved March 1, 2012. ^ "国家简介-国际-朝鲜民主主义人民共和国大使馆". People's Daily. Archived from the original on February 26, 2012. Retrieved March 1, 2012. ^ "Ko and Komid". China Daily. Archived from the original on September 27, 2011. Retrieved March 1, 2012. ^ McElroy, Damien (November 12, 2010). "North Korea 'runs international nuclear smuggling network'". The Daily Telegraph. UK. Archived from the original on December 25, 2011. Retrieved March 1, 2012. ^ William J. Broad; James Glanz; David E. Sanger (November 28, 2010). "Iran Fortifies Its Arsenal With the Aid of North Korea". The New York Times. Archived from the original on November 29, 2010. Retrieved November 28, 2010. ^ Taleblu, Richard Goldberg, Behnam Ben. "Iran's New Missile Cap Offer Is a Total Sham". Retrieved June 11, 2018. ^ "Khorramshahr - Missile Threat". Retrieved June 11, 2018. ^ "South Asia – Powell says nuclear ring broken". BBC News. Archived from the original on April 23, 2013. ^ "Report to Congress, January – June 1999. Unclassified Report to Congress on the Acquisition of Technology Relating to Weapons of Mass Destruction and Advanced Conventional Munitions. Central Intelligence Agency". Cia.gov. Archived from the original on February 7, 2012. Retrieved March 1, 2012. ^ "Syria – Country Profiles – NTI". NTI: Nuclear Threat Initiative. Archived from the original on January 2, 2016. ^ Roth, Richard; Dewan, Angela; Westcott, Ben (February 27, 2018). "UN: NK sending chemical weapon supplies to Syria". CNN. Retrieved March 15, 2018. ^ Bermudez, Joseph S. (1999). "A History of Ballistic Missile Development in the DPRK: First Ballistic Missiles, 1979–1989". James Martin Center for Nonproliferation Studies. Retrieved February 14, 2008. ^ "Hwasong-6 ('Scud C' Variant) - Missile Threat". CSIS.org. Retrieved November 5, 2017. ^ "Missile". nti.org. July 2017. Retrieved December 4, 2017. ^ "IISS report". Iiss.org. Archived from the original on March 2, 2012. Retrieved March 1, 2012. Wikimedia Commons has media related to Nuclear weapons program of North Korea. Normalizing Japan: Supporter, Nuisance, or Wielder of Power in the North Korean Nuclear Talks – An analysis of Japan's role in the Six-Party Talks by Linus Hagström. North Korea's Nuclear Weapons Development and Diplomacy Congressional Research Service.